Summary: Twenty years after the Soviet collapse, leaders of the five Central Asian republics have built functioning states but they have yet to fully implement democratic reforms, decentralize and share power, and develop strong intraregional relations. While these countries began to declare their independence as early as 31 August 1991, beginning with the Kyrgyz Republic and ending with Kazakhstan on 16 December,2 there was not the same popular and elite pressure for independence in the Central Asian region that was found in the south Caucasus, not to mention in the Baltic region. The leaders of the Central Asian republics all wanted more economic, cultural and political autonomy, but they were also very conservative and feared that independence might bring ethnic or political unrest to their republics.3 These fears were borne out in Tajikistan, but everywhere else the transition to independence went smoothly. Now, 20 years later, these five republics have developed into very distinct countries. The ‘face’ of each country is different. No longer can the capital city of one country be confused with that of another. Each has its own national identity. While none are democratic, all have distinct political systems but none have developed institutional mechanisms that provide for the smooth transfer of political power. Some have achieved much more dramatic economic growth rates than others; not surprisingly, the economies of those with the greatest untapped oil and gas reserves have grown the fastest.4 Economic success, though, has not always translated into adequate investment in the social service sector. All of these countries are still experiencing sharp demographic growth, and matching a work force with available jobs will be a challenge everywhere. Every country has worked out its own strategy for dealing with the broader international community. Where they have had the most problems is in dealing with each other, and with the common space they all continue to inhabit, joined by shared waterways and transport corridors. So while the Central Asian countries did better than most outside observers anticipated during the past twenty years, there is no reason to presume that they will do as well during the decade or two that lies ahead. At the same time though, each of these countries has created its own legacy of problem solving, and the precedents in place may prove sufficient to allow them to at worst keep muddling on, and at best to even flourish. The reluctance regarding independence in Central Asia was partly the product of the policies of the Gorbachev years, which simultaneously increased local anger at Moscow’s rule as well as seemingly pointing up the risks associated with loosening social and political controls. The party dismissals came back to haunt Moscow, and shaped politics and lives in these countries in ways that could not have been predicted. Demonstrations protesting the dismissal of Kazakhstan’s long-time party leader Dinmuhammad Kunaev were forcefully put down, with Western sources reporting 200 people injured as a result.6 The anniversary of their death, 16 December, was commemorated as Kazakhstan’s National (independence) Day. (2) Do Strong Leaders Make Strong States? The Tajik Civil War served as a damper on democracy building efforts, particularly in Uzbekistan where the former Communist Party elite also had strong regional divisions and where the Islamic revival was effectively as politicised as it had been in Tajikistan. And leaders throughout the region have been frightened that the kind of populist politics that has been common in Kyrgyzstan could replicate itself in their respective countries. When Akayev fell, during what the Kyrgyz termed their ‘Tulip’ revolution, leaders in neighbouring countries blamed western-supported non-governmental organisations (NGOs) for what happened there as well as for the ‘Orange Revolution’ in Ukraine and the ‘Rose Revolution’ in Georgia. They responded by passing legislation that forced NGOs to reregister, made it harder for them to take foreign funds, hampered public meetings and created restrictions for the operation of independent media. 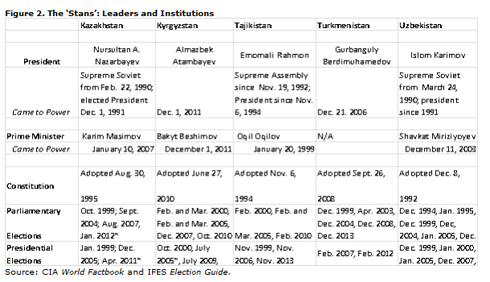 When the Kyrgyz shifted power from the presidency to the parliament and prime minister in the constitution adopted after Bakiyev’s ouster, Russia’s President Dmitri Medvedev called Kyrgyzstan’s plans for a parliamentary democracy ‘a catastrophe’,14 and Central Asian leaders voiced their fears that this would be a source of instability. The other four countries have constitutions which provide for strong presidential systems. President Rahmon gradually reduced the scope of action of parliament and independent political parties, effectively reneging on the terms of national reconciliation, so his powers now mirror those of his presidential colleagues. Turkmenistan’s President Gurbanguly Berdimuhamedov restored the institution of parliament, abandoned by his deceased predecessor Saparmurad Niyazov, who preferred to be known as Turkmenbashi (‘father of the Turkmen’) in the style of Ataturk. He has also eliminated most of the most garish features of Niyazov’s cult of personality, but he has shown little evidence of wanting any real division of power. In Kazakhstan and Uzbekistan power is being ceded to the parliament and the cabinet, more rapidly in the former than in the latter, and competing political parties are now entering parliament, albeit all of them pro-presidential. Both countries have septuagenarian presidents and these measures are designed to help pave the way to inevitable successions. But unless either man voluntarily steps down there is no assurance that fledgling institutions for power-sharing will mitigate elite conflict. While much is made of the importance of sub-national loyalties in each of the Central Asian countries, they are generally speaking of less importance today than they were in the first years of independence. The states are all unitary, power is centralised and governors or akims –as they are generally called– are all appointed, which has allowed the region’s presidents to keep territorial or family/clan based networks from challenging their rule, as they are able to ‘parachute’ in people whose loyalty is primarily to the president. Obviously sub-national loyalties still play a political role, but they appear to be diminishing everywhere in the region. Kyrgyzstan, its two largest cities separated by a more than 10-hour drive over high mountains, has always had something of a north-south divide, but though Bakiyev retained more support in the south than in the north, politicians from all parts of the country were influential in his removal. The Kyrgyz generally preserved their awareness of clan membership even during the Soviet period, but under Bakiyev his nuclear family came to dominate, with little preference shown to outsiders regardless of their degree of ethnic proximity. Regional ties, which played such an important role in the conduct on Tajikistan’s Civil War, have also become less important as President Rahmon appointed his close family to positions of power in the government and economy. As he has grown more secure, Berdimuhammedov has also begun appointing family members to posts that used to be dispersed among leaders of Turkmenistan’s most powerful tribes. Karimov’s daughters are public figures and economic actors, but regional ties are important and there are powerful patronage groups that are partly regional and partly sector specific, so the transfer of power will almost certainly occur behind closed doors, but is unlikely to leave the presidency in the hands of Karimov’s relatives. Kazakhstan’s political environment is even more complex. In the aftermath of the dissolution of the Communist Party, clan, or more accurately zhuz (horde), began playing a major role in Kazakh politics,15 with Nazarbayev favouring his own ‘Great Horde’ whose role in Kazakh history has also been somewhat embellished.16 But, over time, Nazarbayev’s daughters and especially his sons-in-law17 have become very important people in their own right; Timur Kulibayev, his second daughter’s husband, heads Samruk-Kazyna, the company that manages all the government-held shares in enterprises, and so has virtual control of the country’s oil and gas sector. At the same time, though, the physical size of Kazakhstan (the world’s 9th largest), as well as the scale and complexity of the Kazakh economy have contributed to the formation of political patronage groups that are at some distance from the President and his family. The relative speed with which long-time dictators fell in the Middle East during 2011 has led some to warn that Central Asia’s leaders could be brought down just as quickly. But given the nature of their political systems, judgements about the popularity or lack of popularity of any of these men are based on speculation and hearsay. For now, at least, outside of Kyrgyzstan there is no sign that the risk of unrest is greater than the capacity of its national security forces to keep wayward elements in check. This led to the strong condemnation of the Uzbek government in the EU and US, but Karimov’s colleagues in the Shanghai Cooperation Organisation supported what they termed a proper response to a terrorist threat. There is a clear values gap on these questions as the Uzbek authorities would presumably respond with force if challenged again, although their security services have been reorganised to enable them to be effective while limiting the loss of life. This does not mean that there is not a point at which security officers might turn against the government and support insurrectionists. While the breaking point in Kyrgyzstan seems certain to be earlier than in other countries, Kurmanbek Bakiyev lost power precisely because repression went beyond what the Kyrgyz security forces as a whole would tolerate. This was the first major inter-ethnic incident in the region since independence.22 Fear of interethnic strife has hovered over the region since Soviet power began collapsing. Central Asia is a region in which there are no natural geographical divides separating countries and in which national boundaries do not correspond to ethnic ones. Inter-ethnic skirmishes led Mikhail Gorbachev to bring new leaders to power in Kazakhstan and Uzbekistan in June 1989. Nursultan Nazarbayev, a popular prime minister who had been passed over in 1986, was appointed in Kazakhstan, where there had been unrest in the oil city of Uzen.23 Islam Karimov, a relative outsider in Uzbek Communist Party circles who had spent most of his career in Gosplan –the state economic planning bureau–, was appointed in Uzbekistan, whose densely populated Ferghana Valley had been rocked by clashes between ethnic Uzbeks and Meshket Turks. One year later Karimov was left trying to keep an angry Uzbek population from crossing into the Kyrgyz republic to defend their co-nationals when there was fighting between Uzbeks and Kyrgyz in southern Kyrgyzstan. Then, as in 2010 when the fighting was in some of the very same communities as 20 years previously, Karimov succeeded in preventing the conflict from taking on a cross-border character. It could be much harder for Karimov to do this a third time, as there is a lot of anger in Uzbekistan about how other Uzbeks are being treated, particularly in the Ferghana Valley, where there are many extended families that reach into Kyrgyzstan. There is also a great deal of latent tension between ethnic Tajiks and ethnic Uzbeks, this time increasingly of an interstate character. These two people have competing versions of history and claims on the same land, the Samanid24 and Timurid25 empires, respectively, whose lands extended over the territory of current-day Uzbekistan, Tajikistan and parts of Turkmenistan, Kyrgyzstan and Kazakhstan. The Samanid Isma’il ibn Ahmadi (died 907) was the founder of the first powerful Tajik, or Persian-speaking, dynasty in the region, and his mausoleum in Bukhara is reproduced on Tajikistan’s currency. While the Timurid dynasty predates the formation of the modern Uzbek people, as its leaders came from the ‘White Horde’ of Mongols, its founder Timur (1336-1405) is memorialised with a giant statue and museum in downtown Tashkent as the founder of modern Uzbek statehood. His capital was Samarkand, where he is buried in a majestic mausoleum. Samarkand is also Karimov’s hometown. Karimov himself is at least half Uzbek, and did not master spoken Uzbek until after independence. Increasingly language, rather than kinship, has become the primary way in which people in Central Asia assert their national identity, which is a very different concept to citizenship in these countries. Millions of people of mixed ethnicity now list their nationality as that of their country’s titular population, when in Soviet times they might have used another national designation, providing of course that they can speak the national language. While it was commonplace during the Soviet period to offer instruction in multiple languages –in Russian, in the local language and also in the languages of other principle ethnic minorities–, this is no longer the case. Everywhere in Central Asia, official documents must be produced in the national language, but in Kazakhstan and Kyrgyzstan the Russian language is still widely used in public, particularly in the largest cities. In these two countries language is an important tool for political mobilisation, particularly in Kazakhstan where the elite is dominated by ethnic Kazakhs who are generally native Russian-speakers. Nationalists in Kyrgyzstan and Kazakhstan are also more likely to invoke religious themes, claiming a special relationship between Islam and ethnicity. All of the countries in the region are formally secular, but most treat major Islamic feasts as official holidays. While Kazakhstan includes the state’s commitment to ethnic and religious tolerance as part of its nation-building strategy, all have enacted legislation designed to place religion under strong state supervision. Religious organisations must follow strict guidelines for registration and those leading congregations or providing religious instruction must meet strong state criteria as well. Throughout the region this has been used to root out Salafists,26 members of Hiz’but Tahrir27 or other schismatics, who do not adhere to the traditions of the dominant Hanafi mashab (school of law) of Sunni Islam that has historically dominated in Central Asia. For some, though, Islam is a supranational form of identity. Most of these people are termed ‘extremists’, including those that do not formally advocate the use of force,28 and terrorist groups like the Islamic Movement of Uzbekistan and the Islamic Jihad Union (IJU), which are part of the al-Qaeda network. The IMU developed out of radical Islamic activist groups formed in Uzbekistan’s part of the Ferghana Valley in the early 1990s, which after being banned at home, went to Tajikistan to fight with Islamic forces during their Civil War and then fled to Afghanistan. The IMU was responsible for bombings in Tashkent in 1999 and attacks in Kyrgyzstan in 1999 and 2000. The IMU split into the IMU and IJU after ISAF led bombing campaigns in Afghanistan in 2001-02. One or another of them was responsible for bombings in Uzbekistan in 2004. A group of Tajik commanders with ties to al-Qaeda were blamed for a wave of attacks on Tajik forces in 2010 and 2011. In 2011 there were also a series of attacks on security forces in Kazakhstan by local and previously unknown jihadist groups. To date, none of these groups have been able to provide a serious threat to any of the states in which these explosions occurred. Moreover, none of these groups seem capable of attracting mass support for their aims, some of which are inchoate, although all are in some way associated with introducing Shari’a (Islamic) law as the basis of governing. At least for now, the national ideal –which for all but the Russians and representatives of other European nationalities who have become citizens of these states, includes some notion of a special role for Islam– takes precedence over identities based on sub-national or supra-national loyalties. (4) Who Are Our Friends? The quest for security and for economic advantage has been the determining factor in the foreign policies of all of these countries. Initially security concerns drove the Central Asian states closer to Russia and all but Turkmenistan joined the Collective Security Organization (CSTO), formed in 1992. Turkmenistan is not a part of the CSTO or of the Shanghai Cooperation Organisation (SCO) of which the other four Central Asian states, Russia and China were members, because they were pursuing a doctrine of Positive Neutrality, which takes the form of a UN resolution adopted in 1995. Uzbekistan froze its membership in the CSTO in 1999 as it sought to align itself more closely with the US and the other NATO nations and was the first Central Asian state to offer the US basing rights in the aftermath of 9/11. The basing agreement was abrogated by Uzbekistan after EU sanctions and US restrictions were introduced following the deaths in Andijian in 2005, and in 2006 Uzbekistan unfroze its membership in the CSTO, only to refuse to participate in the CSTO rapid reaction force in 2009. It is now effectively an inactive member and cooperating closely with the US and other NATO nations in the Northern Distribution Network. By contrast, Kyrgyzstan, which still has a formal US military presence (at a base that was re-designated a transit centre), has the closest degree of military cooperation with Russia, which did not intervene during the June 2010 fighting in southern Kyrgyzstan but which has presumably offered the new government in Bishkek improved security guarantees. The Kyrgyz authorities have said that the US must leave its facility at Manas in 2014, once it has withdrawn its troops from Afghanistan. Membership in the SCO has enhanced China’s role as a buffer to Russia for the Central Asian states. But this organisation remains primarily a forum for discussion of shared security and economic concerns rather than an effective organ for stimulating multilateral engagement in either area. China has dramatically expanded its presence in Central Asia, especially in the last 10 years. While the US and the EU have been talking since the mid-1990s about introducing alternative routes to get Turkmen gas across the Caspian Sea to the European markets and by-passing Russia (but not through Iran), the Chinese made an alternative pipeline a reality over a three-year period. This pipeline, made fully operational in December 2009, brings Turkmen gas across Uzbekistan and Kazakhstan before it enters China. China is also engaged in oil and gas projects in Uzbekistan, and is now a dominant player with regard to Kazakhstan’s on-shore assets, owning both production facilities and pipelines. Chinese officials provided Kazakhstan with US$10 billion in a loan-for-oil deal in 2009.29 China has also been a major source of lending for Tajikistan’s various infrastructure projects. Russia remains a major economic actor in Central Asia and Vladimir Putin has made further integration with these five countries (by 2015) one of the major goals of his re-election programme. Kazakhstan is already part of a Customs Union with Russia and Kyrgyzstan has pledged to join as well, even though it will complicate the already agreed trading arrangements negotiated when Kyrgyzstan joined the WTO in 1998. Uzbekistan and Turkmenistan have already made it clear that they are not willing to participate, while Tajikistan will probably find it difficult to resist Russian pressure. The current Customs Union, of which Belarus is also a member, is a free-trade zone with a common external tariff regime, although the latter is still not fully in place. What Putin envisions is something akin to the EU, with a common currency and coordinated economic policies. This seems very unlikely to be achieved in just a three-year period, if at all, given the different directions in which the Russian and Kazakh economies have developed. Western-dominated international financial institutions like the World Bank and the International Monetary Fund have played a much greater role in the restructuring of the Kyrgyz and Kazakh economies than they did in the Russian Federation. That is one reason why it is probably already too late to ‘harmonise’ their economic strategies save through force. Though Kazakhstan has been tougher in recent years, foreign investors are playing a much greater role there than they are in Russia, and the investment regime that they confront is more transparent. Though Russia is still a major partner for Kazakhstan’s oil and gas industries –serving as a primary transit route– and Russian companies have generally small ownership stakes in a number of major projects, its economic levers are much less effective than they were 20 years ago. 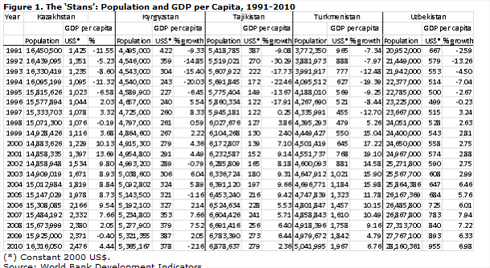 Russia’s levers in Turkmenistan are even more limited. Gazprom (the Russian gas monopoly) continues to buy some Turkmen gas. In fact, in 2011 it bought less than the Turkmen had on potential offer, given the lower than expected demand in Europe, although Iran came in and purchased some of the available surplus.30 Once the South Yolatan field is developed (the Chinese lead the international consortium31 that controls the project) a great deal more Turkmen gas will go to China (which will double its gas pipeline out of Turkmenistan). But there will be a lot of extra gas to go either to Pakistan and India via Afghanistan (the TAPI pipeline) or across the Caspian Sea in an undersea pipeline, a routing that Russia has effectively blocked since the idea was first broached. Employment in Russia also serves as an important outlet for Uzbekistan’s growing population, as its workforce is growing faster than any other in the region. Given Tashkent’s decision to keep its distance from Moscow, Uzbek workers received no special treatment during the economic crisis of 2008-09 (in contrast to the Kyrgyz, who did, at least in part).34 The Uzbeks engaged in a massive public works programme which created a new source of seasonal employment at home. In all three countries remittances have served as an important source of capital for start-ups in the micro and small business sectors. The Kyrgyz and the Tajiks have worked closely with the IMF and the World Bank in restructuring of their economies. The former has gone much further in the introduction of market reforms than the latter. Tajikistan’s major industry, aluminium production, is still under state control and generally assumed to operate for the private benefit of President Rahmon and his family.35 The profitability of aluminium production is enhanced by cheap electricity, and this is also run by a state-owned and state-managed firm (Barki Tojik). Kyrgyzstan’s economic recovery has been hampered by corruption at the top of its political system as well, although profits from Kyrgyzstan’s gold exports (its major natural resource export) have largely gone towards the benefit of the state. But although economic reform has gone much further there than in Tajikistan, and the education system is in somewhat better shape, Kyrgyzstan still has an uncertain future, given the small size of its economy and its distance from markets. Unemployment is not a serious problem in either Turkmenistan or Kazakhstan, where even unskilled and semi-skilled labourers can find work if only to be underemployed working ‘off-the-books’ or for themselves. There is an acute shortage of skilled labourers in the two countries, with both governments placing some primacy on technical training programmes. The Turkmen, whose education system was effectively destroyed under Niyazov, have much further to go in this regard, and the shortage of cadres in Turkmenistan reaches up to the senior ranks of government. By contrast, reform-minded and well-trained Kazakhs are now found in all fields of the economy and in business. This, however, is no guarantee that the government will succeed with its plans for economic diversification, which are seen as Kazakhstan’s solution to its overdependence on the extraction of natural resources. Uzbekistan and Turkmenistan have taken far less guidance from the international financial community than the other three countries. The Uzbeks began an internationally-monitored financial stabilisation project to support the introduction of their currency, the Uzbek som, but abandoned it in the late 1990s36 in favour of a policy of limited convertibility of currency price controls and continued state management of the economy in general and the agricultural sector in particular. The state still owns the major resources in the country and has been able to maintain favourable trade balances and build gold reserves through income from its three principal export items: natural gas, gold and cotton. But the lack of free access to freely-tradable international currency has substantially slowed the development of a private sector in Uzbekistan, which in turn is increasing the amount of pent-up social pressure in the country. 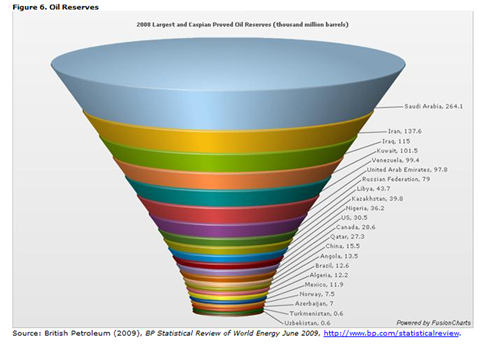 Many of these same trends exist in Turkmenistan, but the latter’s population is just over a tenth that of Uzbekistan and the income from the gas sector has been more than sufficient to allow the continued funding of a generous social welfare net for the country’s citizens. While fortunately there has not been an interstate conflict in Central Asia, if anything over the years the tensions between countries have increased, both because of security concerns and because of competing economic agendas. Turkmenistan also introduced visas for all foreigners, including Central Asians and Russians as well as those who come from states that were never part of the Soviet Union. And both Uzbekistan and Turkmenistan long maintained the Soviet-era practice of requiring exit visas for their own citizens, something that the Turkmen did not drop until after Niyazov’s death. The Kazakhs, who along with the Kyrgyz have the most open borders in the region –it being quite easy for foreigners to obtain visas to enter either country, with few restrictions on temporary residence–, were so frightened by events in Kyrgyzstan in April 2010 that they shut their borders to Kyrgyz citizens. Normal entry was never fully restored, as from July 2011 Kazakhstan unified its tariffs with those of Russia, interpreting this to mean that it was obliged to close down all the small private traders who brought in goods obtained from China (which like Kyrgyzstan is a member of the WTO) to sell in Kazakhstan. 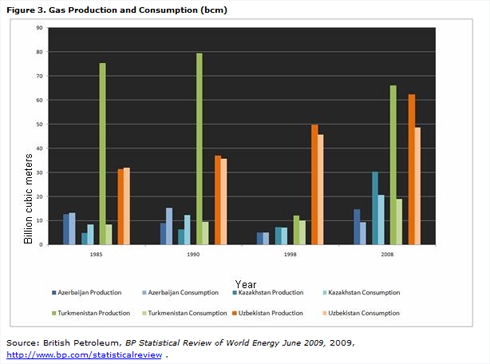 The biggest cause of tension between the countries in Central Asia is because of access to water and the cost of energy. The principle sources of water for southern Kazakhstan and the other four Central Asian states are the Amu Darya and Syr Darya rivers, whose headwaters are found in Tajikistan and Kyrgyzstan, respectively. During the Soviet era, cotton cultivation was an agricultural mainstay throughout Central Asia, with up to three plantings each year of this highly water-dependent crop. Cotton cultivation is generally seen as a major cause for Central Asia’s depleting water table (of the Syr Darya and Amu Darya Rivers) and the death of the Aral Sea. The heavy use of fertilisers in the industry created a host of environmental and human health hazards. While Soviet-era collective farms have either been fully privatised or turned over to collective ownership and management, the sale of raw cotton remains under state control in both Uzbekistan and Turkmenistan and was only liberalised in Tajikistan in 2008. Profit from the cotton industry is still a major rent that is shared out among key members of the elite in all three countries. Water has always been provided free of charge (something that made a great deal of sense in the Soviet system, of course), with each country responsible for maintaining reservoirs and irrigation systems (a task that was under central control in the USSR and mostly exercised by government offices and institutes located in Tashkent). The system of water and energy use was designed as an integrated system. There was a single electricity grid for Southern Kazakhstan and the rest of Central Asia. The release of water in spring and summer provided water for the cotton fields and other agricultural use and for the generation of electricity. In winter electricity was generated extensively from natural gas, which was also used for heating. 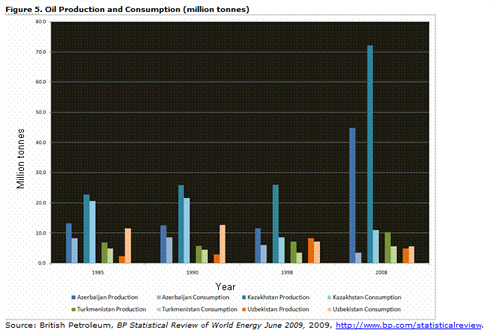 Uzbekistan was the major source for gas for its neighbours, even for Kazakhstan which had its own abundant supply of natural gas. Most of that went to be processed or used in the Russian Federation, which was closer to the source of supply. Now Uzbekistan expects its neighbours to pay for their gas, and to pay something close to what Uzbekistan would receive by selling the same gas to Russia for sale in Europe. Kyrgyzstan and Tajikistan do not want to do this, and do not really have the resources to pay for near European-scale pricing, especially since their energy systems are still largely unreformed and highly inefficient and their commercial and household users both usually cannot afford and are averse to sharp rate hikes. While it seems unlikely that Tajikistan will actually go through with these plans if the World Bank endorses a design that is lower and so less expensive and less likely to provoke Uzbek ire, nothing is guaranteed in Central Asia. The Tajiks could dam the Vakhsh, just as well as Uzbekistan could take preventive action against Tajikistan to prevent it from doing this. This leads to an atmosphere in which the elites in both countries always think the worst about one another, so when there is an explosion on an Uzbek railway line connecting Tajikistan to the west and north, the first reaction is that it was the Uzbek government doing it in retaliation for the death of an Uzbek border guard at Tajik hands.40 No explanation is too implausible to be true. What makes everyone nervous both within and beyond the region is that some day one of the region’s leaders will decide to punish the leader of a neighbouring state for an offence that is either real or imagined, leading to a spiral of responses that gets out of control. This has not happened in the last 20 years. But Central Asia’s leaders know each other very well and, much like fighting turtles, know when to pull their heads back within their shells. Their successors may not be as good at anticipating each other’s reactions, or the population of competing ethnic communities, buoyed by local figures, may take it in their own hands to inflict punishment. June 2010 in southern Kyrgyzstan provided a foretaste of just how much antagonism lies underneath the skin of those who ordinarily pass as civil individuals. It is hard to know when the veneer of civilisation might disappear, when leaders die or are seen to be failing, if their successors are perceived as weak. This was not the case with Niyazov’s sudden death, and it is hoped will not be the case in the region in the future. There will be a lot of high-risk moments in the next decade in Central Asia and the region’s population is young and is entering into the job market when the global economy is weakening and in one of its least competitive regions. All one can hope for is that the next generation of leaders emerging in these countries will be up to the challenges that they seem certain to face. The United Nations admitted these five countries on 3 February 1992. United Nations, ‘Member States’, http://www.un.org/en/members/. The Kyrgyz republic declared independence on 31 August 1991, Uzbekistan on 1 September, Tajikistan on 9 September, Turkmenistan on 27 October and Kazakhstan on 16 December of thje same year. See Martha Brill Olcott (1992), ‘Catapult to Independence’, Foreign Affairs, Summer, for a discussion of the mindset of Central Asia’s leaders in the waning days of the USSR. 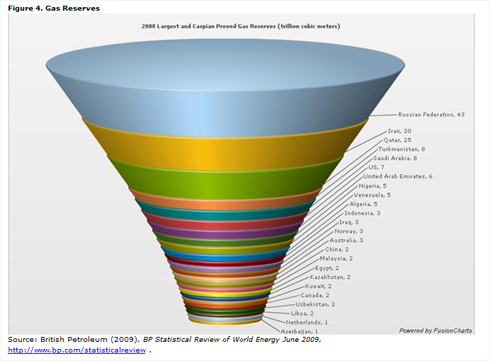 For oil and gas production, consumption and reserves by country, see Appendix. See Sergeii Petrovich Poliakov & Martha Brill Olcott (1992), Everyday Islam: Religion and Tradition in Rural Central Asia, M.E. Sharpe, Armonk, NY, for a good example of ‘scientific’ explanations used to justify such CPSU policy. Martha Brill Olcott (1995). The Kazakhs, Hoover Institution Press (2nd edition), Stanford, CA, p. 246. Masaliev remained Communist Party leader but was defeated in his bid to become President of the Republic, a post that all the other CP heads in Central Asia took. Askar Akayev, a trained physicist, was a CP member and part of the scientific-technical elite who became involved in politics in 1989 as a member of the popularly-elected Congress of Peoples’ Deputies of the USSR. Bakiyev served as Prime Minister from 2000 to 2002, but was forced to leave office to deflect blame from Akayev after demonstrators were accidently killed by the local authorities in the town of Aksy. Roza Otunbayeva, who served as Foreign Minister under Akayev, and briefly under Bakiyev, was Interim President from April 2010 until December 2011, when she was replaced by Almazbek Atambayev, who was elected President in October 2011. He served as Prime Minister under Otunbayeva and had been Prime Minister under Bakiyev as well. Rahmon was elected President in 1994, 1999 and 2006, after a constitutional amendment granted him the the opportunity to run for two additional seven-year terms. In the lead-up and throughout the Tajik Civil War there were multiple groups formed and abandoned. From the various coalitions jostling for power, two main groups emerged: the Popular Front and the United Tajik Opposition (UTO). The Popular Front supported President Rahmon and included among its followers Communist Party supporters from northern Khujand and southern Kulob. The UTO, led by Said Abdullo Nuri, counted as its supporters mainly Islamists and secularists from the southern and eastern regions. The 1997 General Agreement on the Establishment of Peace and National Accord in Tajikistan officially concluded the war. The accord provided for the demobilisation of fighters from the losing side, the UTO and set terms for their reintegration into governmental structures. http://en.rian.ru/russia/20100910/160545210.html. These were reiterations of comments made earlier at a G-20 meeting. See,’News Conference following G20 Summit’, President of Russia, 28/VI/2010, http://eng.kremlin.ru/transcripts/517. Edward Schatz (2005), Modern Clan Politics: The Power of 'Blood' in Kazakhstan, University of Washington Press, Seattle, WA. The ‘small’ and ‘middle’ hordes produced the great Khans during the period of the Kazakh tribal confederation, the 15th through the 18th centuries. Nazarbayev’s second son-in-law, Rakhat Aliyev, fought with Nazarbayev and fled the country in 2007, because of politics, if the former is to be believed, or because of Aliyev’s criminal activities, according to the Kazakh authorities. There have been demonstrations broken up with the use of force in microregions near Almaty, where protestors pressed for better housing opportunities and against development plans. Many of these protests occurred in the spring and summer of 2006; one of the largest occurred in the microregion Bakai, where about 1,500 people rioted. See Martha Brill Olcott (2010), Kazakhstan Unfulfilled Promise, Carnegie Endowment for International Peace, Washington DC, p. 270. In 1989 there were clashes over water rights between Kyrgyz and Tajik villagers in border communities, and in 2008 there were some isolated incidents in these same regions. See Yrys Kadykeev (2008), ‘Tajik-Kyrgyz Water Clash a Sign of Things to Come’, Institute for War and Peace Reporting, 4/IV/2008, RCA issue 539, http://iwpr.net/report-news/tajik-kyrgyz-water-clash-sign-things-come. The fighting took place in June 1989 and was largely between Kazakhs and North Caucasians who had been previously forcibly relocated to the region by Stalin. Thousands of individuals participated in the protests and at least five people were killed. See Stephen K. Batalden & Sandra L. Batalden (1997), The Newly Independent States of Eurasia: Handbook of Former Soviet Republics, Oryx, Phoenix AZ, p. 148. Ismail Samani, the founder of the Samanid dynasty, is generally recognised to have lived from 849 to 907. He is buried in the Ismail Samani Mausoleum in Bukhara, Uzbekistan. Timur (1336-1405), also known as Tamerlane, was the founder of the Timurid dynasty. Salafi (derived from its Arabic root salaf, ‘to precede’) is the term that denotes a follower of the Salafi movement in Islam that calls for the return to the use of the Quran and the sunnah (the actions and sayings of the Prophet that establish a model for Muslim conduct) as the only sources for religious rulings. The modern form of Salafiyah was established in the early part of the 20th century. Its core objectives were to restore Islam to its pristine form by condemning the mentality of taqlid (‘blind imitation’) and jimud (‘stagnation’) of the Muslim traditionalist clergy. See ‘Salafiyah’, The Oxford Encyclopedia of the Modern Islamic World, vol. III, Oxford University Press, 1995, p. 463-468. Hizb-ut Tahrir was founded in the 1950s. Its objective is the overthrow of governments in Muslim countries and the creation of a caliphate. Hizb-ut Tahrir maintains that it does not condone violence and that its focus is primarily ideological, but opponents of the organisation say that it radicalises members and sets them on the path to violence. The organisation is recognised as extremist and banned by numerous countries, including all the Central Asian states, Russia and states in the Middle East and North Africa. This includes members of HT, ja’aamat tablighi, and many Salafists would fit into this category as well. The consortium includes China National Petroleum Corporation (CNPC), Gulf Oil & Gas, Petrofac, Hyundai Engineering and LG International. The TALCO factory is state owned, but simply processes alumina into aluminium and both the raw materials and the finished product are the property of its management, of which state enterprises and several unnamed persons are the shareholders. The Uzbek government invited the IMF into the country in 1994, accepted its stabilisation programme and then abandoned it in 1996. Martha Brill Olcott (2005), Central Asia's Second Chance, Carnegie Endowment for International Peace, Washington DC, p. 23. In 2004 Uzbekistan announced that it would begin removing the mines. Uzbekistan and Kyrgyzstan have since adopted a visa-free regime. Kyrgyzstan is constructing the Kambarata-1 and Kambarata-2 hydro power plants on the Naryn River. This article originally appeared in Elcano Royal Institute.